Each friend is special, even best, in their own way. Whose is your kindest, funniest, specialist friend? Super like Superman. The best, the most powerful. In English we put -est at the end of short words, words that are one or two syllables long. If the word is longer, we use most. Sometimes we use comparatives, just to show how two things are different from each other. 1 Think about your friends. 2 What makes each of them special? 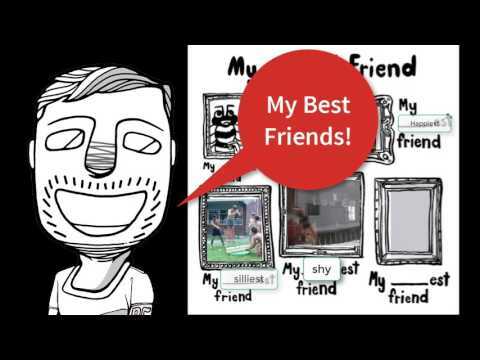 3 Draw pictures of your friends in the frames. This activity helps us practice using superlatives, and it shows us how these words take on meaning in our lives.